Mobile devices still haven’t completely taken over, yet organizations seek a single management platform, especially on devices running Windows 10. Tools to streamline IT and business operations, such as automation and zero-touch set-up, are becoming more widely accepted. Here is a look back on what we observed during 2018. 1. Mobility is increasing, yet the primary device type used by employees is still a desktop. In late 2016, mobile internet usage surpassed that of desktop for the first time. However, in business use, according to August 2018 findings from online technology community Spiceworks, for 68 percent of the workforce, the primary device type used by employees is still a desktop. Indeed, reports of the desktop’s demise are premature. As such, companies are upgrading operating systems and continue to shift from Windows 7 to Windows 10 — driving a major desktop PC refresh. But what about mobile devices? In a previous Spiceworks study conducted in 2016, 83 percent of IT pros predicted mobile devices — specifically tablets — would eventually replace desktops. However, that day is still far off: for now, only 1 percent of companies reported that most of their employees were using tablets as their primary computing device. 2. Security and control drive the need for a single platform to manage multiple devices. Miradore has found that while desktops and laptops may serve as the main computing device, employees still rely on smartphones daily to check email or access business data. Nowadays, employees are doing work with multiple devices, and organizations are increasingly looking for a single vendor and management platform. Managing all devices via a single platform is known as unified endpoint management (UEM). It’s an approach to securing and controlling desktop computers, laptops, smartphones, and tablets in a connected, cohesive manner from a single console. Windows 10 continues to introduce features that make it more practical to manage PCs as part of a UEM approach. Microsoft’s inclusion of mobile device management (MDM) application program interfaces in Windows 10 has made UEM a possibility on a large scale. Prior to the release of Windows 8.1, there was no way for MDM software to access, secure or control the operating system and its applications. Restricting device usage, e.g. WiFi or Bluetooth connectivity. Installing and managing Universal Windows Platform (.appx) and Microsoft Installer (.msi) applications. Security is often the main driver in adopting a device management system. Another consideration is control, as an organization needs visibility of both hardware and software assets. Adoption of BYOD policies will continue to proliferate; while they provide cost savings and a huge benefit for employees, they still present security risks. 3. Automation and zero-touch set-up are becoming must-have’s. Automation — installing apps and settings remotely — is becoming less of a nice-to-have and more of a need-to-have, as employees are increasingly remote and IT managers may not be available when needed. Besides adding a layer of convenience, IT automation reduces human error and increases overall organizational efficiency. 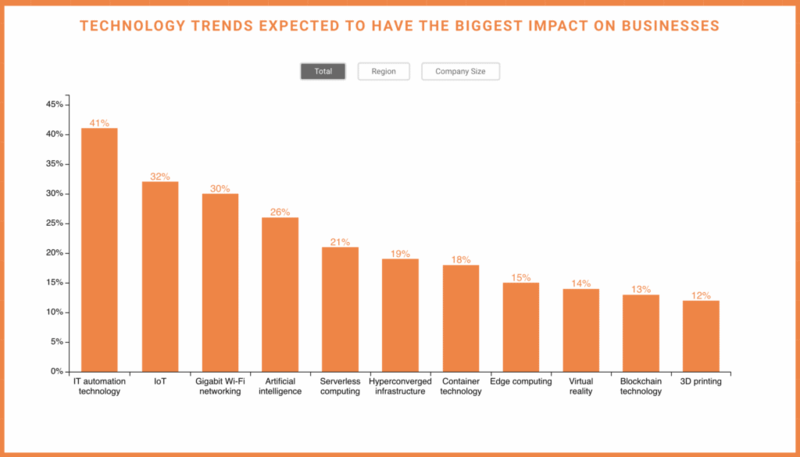 In the Future Tech section of its 2019 State of IT report, Spiceworks found that 57 percent of companies either use or are expecting to use IT automation within the next two years. Additionally, more than 40 percent of IT decision makers foresee IT automation technology having the biggest impact on their business. Zero-touch set-up has also become a must-have in organizations large and small. Already available with Apple Business Manager and Android Enterprise, zero-touch will continue to grow stronger as it frees up IT’s time in setting up employee devices and employees can get to work faster, as devices are already configured before being shipped to the office or work location. Miradore expects the use of automation and configuration tools to continue into the year 2019 and beyond. The Case for Agent or Agentless: Which One Do You Choose for Your Organization?